Click on the appointment you want to view the changelog for. Appointments can be accessed from the Dashboard, Calendar, Clients, or Reports & Data sections. Click in the upper right corner of the window. 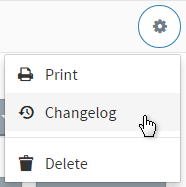 Select Changelog from the menu.